Earlier versions of Firefox, stored user passwords in signons.txt file which was located in Mozilla profile directory. (Mozillazine, ‘nd’) Even though for long time this file is encrypted, it is not 100% hack proof. Having an option like “password manager tool” could also make users vulnerable against cross site scripting. Basically if there was a malicious link on one of the websites that user visits, clicking on to it may redirect user onto a phishing website and could cause security problems. Signons.txt file now has changed to encrypted signons.sqllite (Sql Lite file) with new versions of Firefox. I haven’t tired to decrypt data from the file, but having login credentials in a file like this onto local hard drive doesn’t seem to be a good idea to me. Meanwhile Firefox offers its users sync option, which allows Firefox users to sync their browser data with Firefox’s servers. If this become more popular soon we may not have this complicated password management tools, instead we could use cloud. If we assume that one of the nodes is faulty, we could make nodes also talk to each other and make sure they are getting same messages. 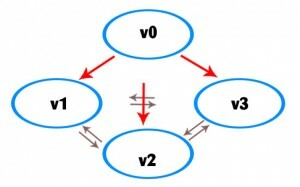 For v3, if V0 is equal to V1 or V2, v1 can make sure it received correct information. If any of the nodes receive a different message from 1 node, they can compare messages with other nodes and can find out which node is faulty.